–Jack Granatstein, Who Killed Canadian History? “You’ll never see the big picture by looking through the microscope of a single academic specialty. That’s one lesson of this important book. Drawing on history, economics, political science, demography, philosophy, psychology, anthropology, sociology, even poetry, Crowley constructs an insightful new interpretation of Canada’s still recent shift to Big Government and the “fearful symmetry” of the coming shift back to its more classically liberal origins. Many new and surprising connections are drawn and in the process many a conventional wisdom bites the dust. Do you love Big Government? Look here for compelling reasons – moral reasons – to reconsider. Do you dislike Big Government but despair of its seemingly unending growth? Find here new reasons for cautious optimism. 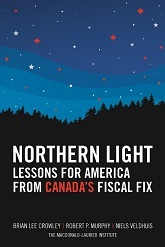 Do you simply seek to understand the particular trajectories of Big Government in Canada? Seek no further.